"EC Mouldings brings environmentally friendly mouldings to Europe"
All our mouldings are made by E-Wood Moulding (Malaysia). The wood that is used is Durian - harvested from Durian trees used in orchards and plantations. The harvested trees were no longer economic and were replanted. 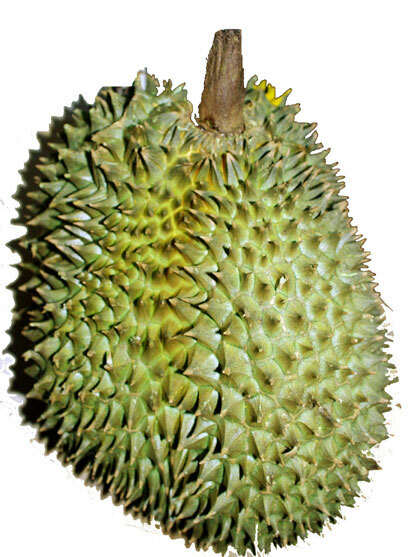 Durian is an evergreen tree and can be up to 40m tall. You can mainly find them in South-East Asia. The fruit is egg-shaped, 15 to 30cm large and weighs up to 8kgs. It's the most popular fruit in Indonesia, Malaysia and Thailand. The edible flesh emits a distinctive odour, strong and penetrating even when the husk is intact. This gives the fruit the nickname "smelly fruit". The best known description of the fruit is "it smells like Hell, but tastes like Heaven”. The durian wood that is used in our factory is harvested from the orchards. After about 30 years, the fruit trees stop carrying fruits and are replaced. 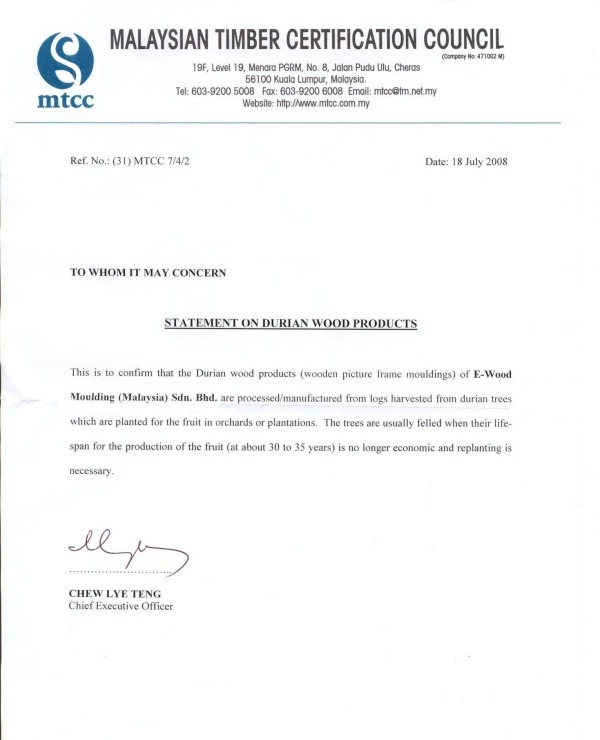 E-Wood Moulding received an official certificate to prove the origin of their wood. Durian wood is softer than ramin, so it's easier to chop, cut and join. But the wood is harder than ayous, giving us the possibility to guarantee top-quality mouldings. The wood is fingerjoint to secure straight mouldings. Most of the paints used by the manufacturer are already waterbased and environmentally friendly. The manufacturer is also working along with the suppliers of hotstamp film to find ways to make new films in an environmentally friendly way. "we aim to become one of your favourite moulding suppliers !"